Growing up in Wellsboro, Penn., UW Bioengineering master’s student Dylan Guelig liked to tinker. A hands-on learner, he worked on bicycles before moving on to fixing old cars, building furniture, wood-working and metal-working, accumulating a range of mechanical skills. He says it was a natural choice to earn a degree in mechanical engineering, which he did at Cornell University in 2011. Graduate student Dylan Guelig develops disease screening tests for low-resource settings. He will earn his master’s degree in July 2018. Now, Dylan is set to graduate with his master’s in bioengineering from the University of Washington in July. His work and evolution from mechanical engineer to bioengineer has been guided by his desire to improve people’s lives, particularly in lower resource settings. At age 10, he took an influential trip to Jamaica with his parents. “That trip sparked an early interest in the broader world, and that never leaves you once you’ve visited low resource settings,” Dylan says. After earning his bachelor’s degree, he wanted to use engineering to help others, and he found an opportunity with BURN Design Lab in Vashon, Wash. He worked to design and manufacture clean-burning cookstoves that improve people’s health outcomes in areas where they still cook with wood and charcoal fuels. As part of his job, he traveled to Cambodia to supervise a field project and see the product in action. “It was an exciting year working for a start-up, and in addition to using my engineering skill set in taking products to commercial scale, it also helped me think more broadly of the economic implications of technology development,” Dylan recalls. “I’m definitely committed to finding ways to complement impactful product development to with economic development in lower income countries.” Some of the products Dylan helped design are currently manufactured by BURN at a factory in Ruiru, Kenya. By this time, Dylan had gained a lot of experience designing systems that manage heat transfer, particularly in products suited for low resource environments. So when an opportunity at Seattle-based PATH came along to design global health tests that featured a lot of heating requirements, he took it. He worked with the PATH diagnostics group on prototyping and device development for point-of-care infectious disease testing. He used many of his mechanical engineering skills, but he also gained a new appreciation for the opportunities at the intersection of devices and biology. During his time at PATH, the group started collaborating with UW Professor of Bioengineering Paul Yager. “It was an obvious choice for me to apply to UW as I had connections in the department, and I was really excited about using a new skill set for all the global health opportunities in Seattle,” Dylan says. But first he wanted more hands-on experience, so he took a few months off before starting his master’s degree to work at a rural hospital in Bangladesh. Dylan says he essentially just showed up at a 150-bed hospital in the remote Northwestern part of Bangladesh with an engineering skill set and found projects in the neonatal and pediatric wards to help with as best he could. Although there was no formal arrangement, it allowed him to work closely with clinicians and patients in a low resource area. “It challenges your world views and your approach to technology development when you’re at the bedside realizing, wow, this is entirely different from any clinical setting I’ve been to in the U.S.,” he says. 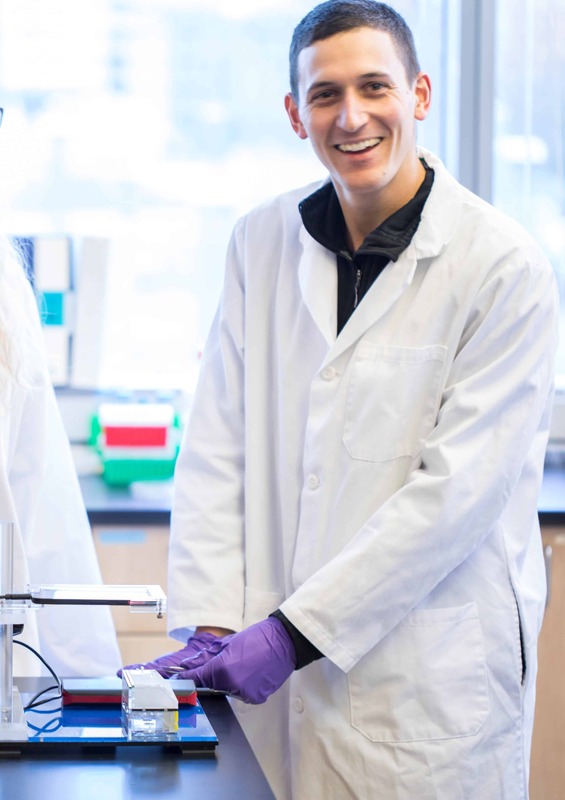 At UW, Dylan has been working with adviser Dr. Yager on low-cost, ultrasensitive rapid tests for infectious diseases that can be used anywhere in the world. “We’ve shown that you can perform a lot of complex chemistries with simple devices using clever designs with paper membranes,” Dylan says. He has been developing a cartridge-style two-dimensional paper network test that can detect minute amounts of proteins present in deadly flu viruses as well as a similar test for the Ebola virus. Normally, testing for flu or Ebola involves a skilled clinician processing multiple timed steps in a well-equipped laboratory, taking up to six hours. The Yager team is targeting results in less than an hour, with a simple, automated process. In the system Dylan is working on, the user applies a nasal swab for flu, or blood sample for Ebola, onto the cartridge (something like a pregnancy test) and inserts the sample into a port on a hand-held “reader” box. The low-cost electronic “reader” device is battery-powered and reusable, while the low-cost cartridge has no electronics and is disposable. The system uses fluorescence to detect the proteins and electronics to process that signal and provide a clear positive or negative result, with no need for user interpretation. Dylan enjoys backcountry skiing. 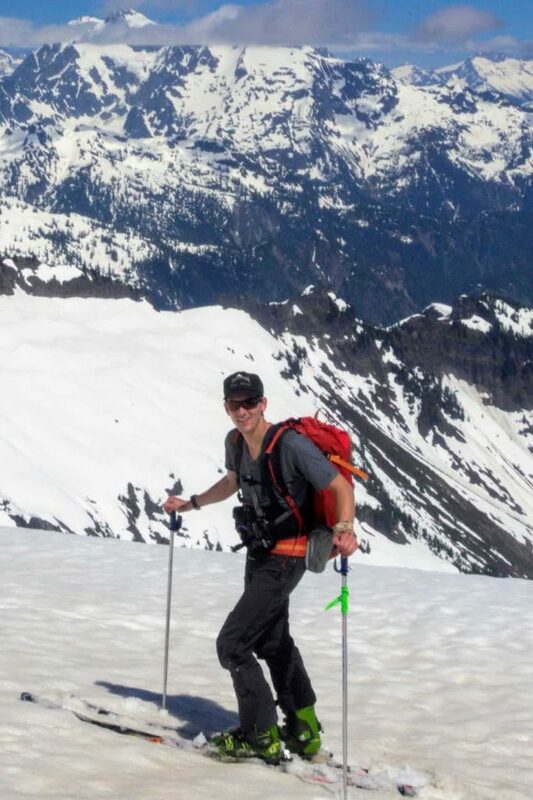 Earlier this year, he explored North Cascades National Park near Mt. Shuksan, east of Mt. Baker. The challenge Dylan is addressing is designing a cartridge that controls the delivery and flow of very small volumes of fluid to perform the assay chemistry. “I’ve been using all of my mechanical engineering background to manage the flow and timing of different reagents to precise locations to make it easy to use and minimize user steps as much as possible: we envision a truly sample in, results out system,” he says. The team recently submitted a paper describing their advances. After graduating, his goal is to work for a small medical device company aimed at taking proven prototypes up to the commercial scale. He hopes to apply his accumulated skill sets to the second half of product development and turn a promising product into one that makes a clinical impact. He’s setting his sights on staying in the Northwest, not only for the opportunities in industry, also for what’s available outdoors. 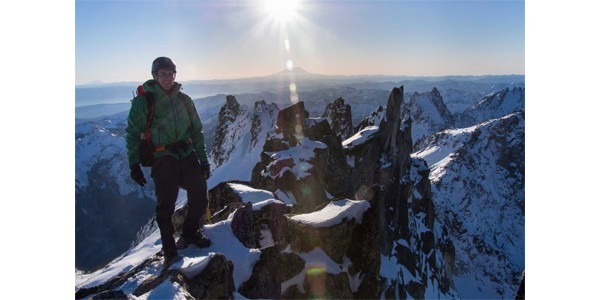 The region seems tailored to some of his favorite activities: climbing, mountaineering and backcountry skiing. 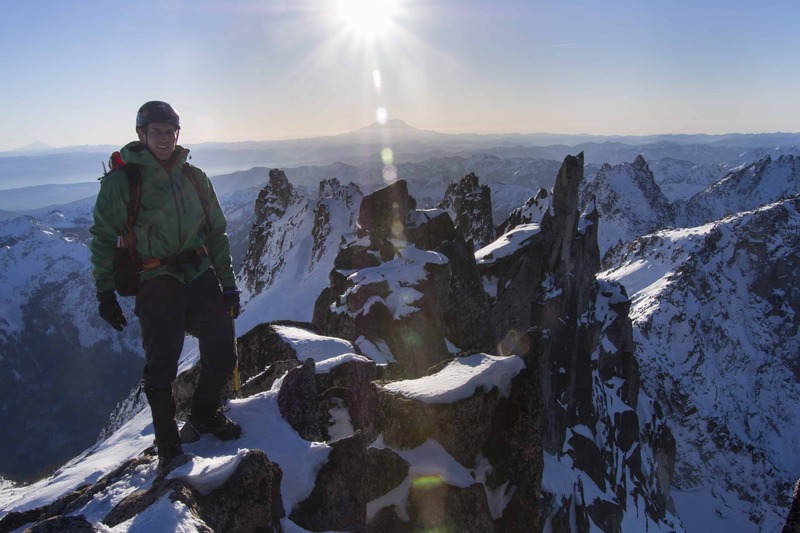 Dylan Guelig atop Dragontail Peak, a challenging climb southwest of Leavenworth, Wash., in 2016. Mt. Rainier is in the distance.